It’s been a bit of an indulgent weekend, feasting our senses, and there’s more to come. We started with the visual and a trip to the Guildhall Art Gallery in the heart of the city for an exhibition of John Atkinson Grimshaw paintings. Grimshaw started out as a bit of a fellow traveller with the Pre-Raphaelites, but quickly moved away to his own style, typified by his stunning nocturnes of both town and country. These have a photographic clarity and use of depth of field, and an extraordinary understanding of light, natural and artificial, direct and reflected. I discovered his work in my teens and was very struck with his silhouetted figures and lampposts against green skies. Actually his figure work is pretty poor, he is much better at crowds where you get the essence of bustle and little knots of humanity; when he puts a solitary figure into his landscapes you feel it is there purely for convention and scale, a bit like the woman in a red coat in picture postcards of the 60s and 70s; and the proportions are frequently suspect – one group of young women all looked decidedly implausible: if the middle one had been standing she’d have been around eight feet tall! Allegedly Grimshaw’s fellow painters were scandalised by the fact that he worked from photographs (black and white obviously and fairly rudimentary at this stage) and by his style of painting which is very smooth – there are no visible brush marks. This gives his skies a clarity and lucidity which is very true to life – you can feel the cold of his winter moon, wrapped in scudding cloud, and there is definitely a feeling of the painting as a source of light. it’s as though he created his own clip art figures to go into his landscapes. However I can honestly say there isn’t a single painting in the exhibition that isn’t at least entertaining. My particular favourite is of tall ships at anchor (Nightfall down the Thames). At first you see the moon, and then the thin cloud, then the mass of St Paul’s in the background and then the forest of masts and rigging … and then you notice that there is a small light on the rigging of the most prominent ship, and then you notice another and another … lights everywhere, tiny pinpricks, reflecting in the gentle ripples that ruck the surface of the water. You can almost hear them slap against the wood. Reproductions do not do these pictures justice. It is really exciting to see the real thing. There are some gaw’blimey interiors with a bit of a Tissot feel to them (an influence apparently), though more sentimental and fussy – this is where you remember he was a Victorian, and wish he wasn’t quite so photographic in his recording of every last plate, but even in the ghastly Dulce Domum, where the woman of the house doesn’t quite manage to sit convincingly in her over decorated chair, I was captivated by a small patch of green velvet in a chair back, the nap brushed up the wrong way where someone has been resting against it. In his later works Grimshaw turned to daylight most emphatically: there is a lovely beach scene that reminded me of Hendrik Willem Mesdag’s Panorama of Scheveningen in 1881 (though nothing like the same scale!) which must be close in time, with its crowded busy water edge, and empty sands in the foreground, but the detail is more sketched and the light is all his own, flooding and overwhelming the day-to-day excitement of children at the sea. Pyrrhic dance - Lawrence Alma Tadema (wikicommons) If you think THIS is silly look up Pyrrhic dance on youtube! We had a quick look at the rest of the collection while we were there, and they have a hilarious collection of large-scale historically themed paintings of great imagination, Salome dancing for Herod, (some fascinating faces in the onlookers) Greek warriors dancing a ‘pyrrhic’ dance like some ancient version of Strictly…, rival philosophic groups in a cabbage field… (why?) some predictable worthies of London, some Pre-Raphaelites, and some London cityscapes (my favourite by John Virtue, almost entirely black with a sky just emerging behind St Paul’s) and, in the basement, discovered relatively recently, the remains of the Roman amphitheatre. There is only a scattering of foundations and a bit of wall about hip height, and a miraculous drain with the wooden lining still preserved, but the way it is presented, lit only as you walk into it, the columns holding the building up with figures drawn in light, and the rest of the amphitheatre and gladiators sketched in on the wall ahead of you as you come in, like some soon to be realised hologram, is quite thrilling: despite being in a fairly small underground space it feels like you are in the amphitheatre, and then you notice above the air-conditioning a faint hubbub of voices that occasionally peaks in roars of approval, though still very faint; like voices reaching from the past. I’ve seen more complete Roman amphitheatres in France and Spain, including ones still in use they have worn so well, but this works. It shouldn’t but it does. We had walked from London Bridge, and decided to walk back via St Paul’s, the Millennium Bridge and Bankside. This is a bit of the City that is hard to love, all unattractive concrete, glass and steel, whereas the walk up was all limestone, just as ostentatious and blocky, if marginally less oppressive; but I do like the way the streets still hold the medieval pattern of London in their narrow twists and dog-legs, and their names. And there is a church on almost every corner, and mostly they are open, often with a café in the crypt. We bought sandwiches, and A said, we need a churchyard to sit in, and I glanced up and there was a spire, we walked a few yards turned left and there we were, at the Guild church, which seemed appropriate seeing we’d just been at the Guildhall. Walking over Millennium Bridge we passed two accordionists and a fiddler playing Autumn Leaves as a Tango, which managed to make it rather more dirge-like than ever. The far end of the bridge there was a steel drum player who was a lot more cheerful. 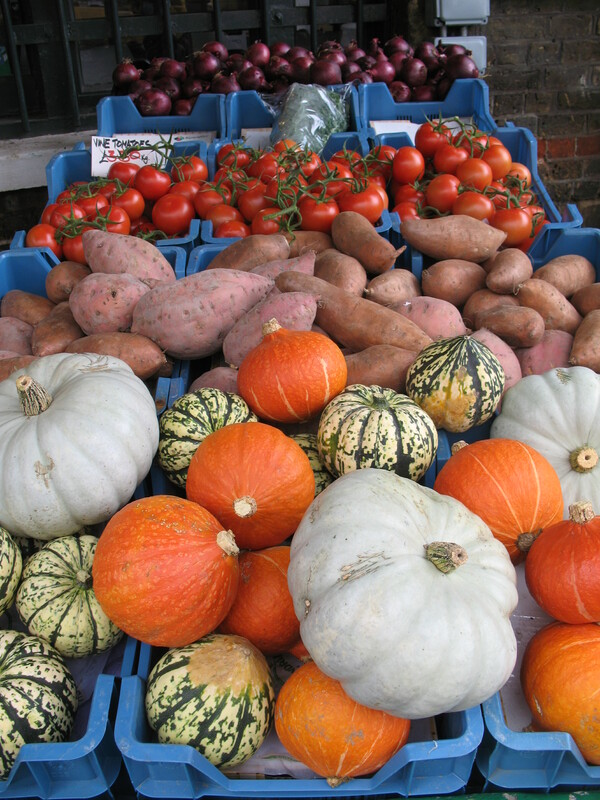 We had been thinking of dropping into the Tate for the Gerhardt Richter, but we already had museum feet (and hips and knees) so we kept going and, recalling that it was Friday, instead went to Borough Market. 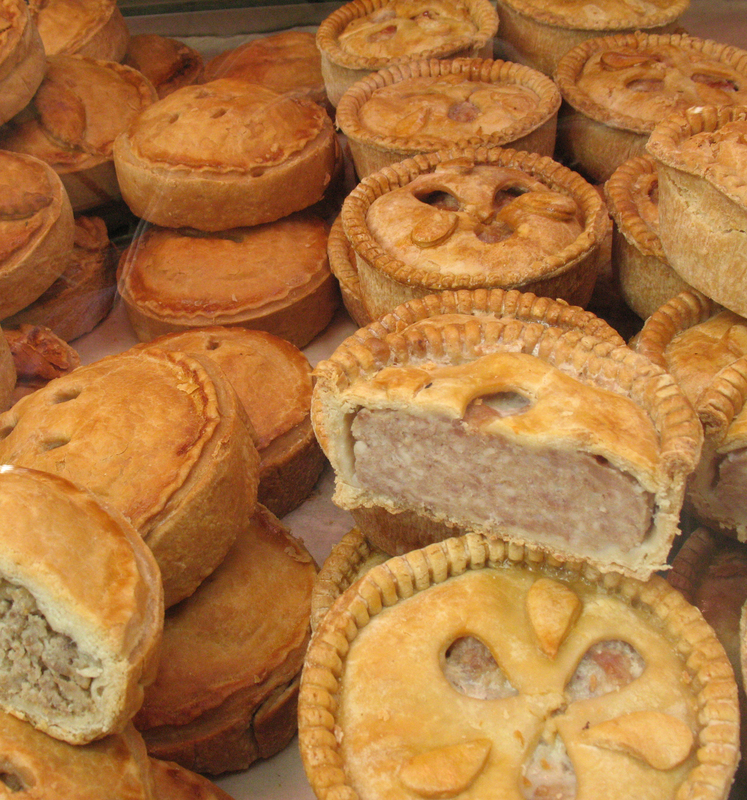 We were intending to just pick up a bit of cake for tea, but you can’t just anything there, you have to check every stall and resist what you can bear to resist, and leave only when your bags are full or your purse empty. We found an interesting liquorish stall, and the Chocolate Artisan (of course) and a spice stall, and a cake stall which we could not resist, and plenty that we could. Saturday, and I persuaded A away from her book proofs to go to the Union Chapel at Highbury ( I love the Overground! 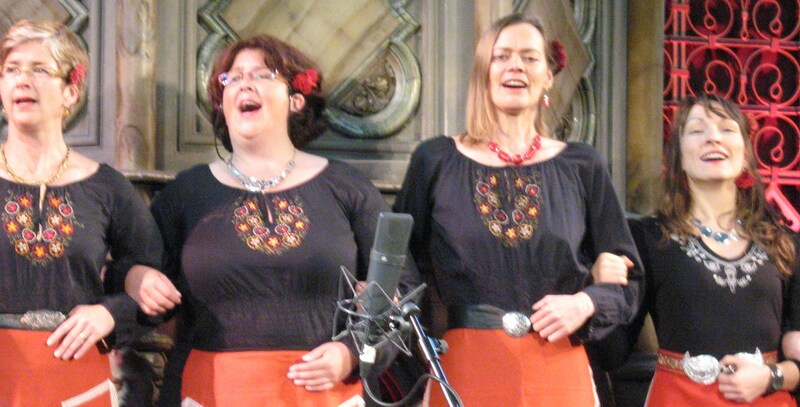 34 minutes on the train, 3 minutes on foot either end) for their daylight music concert at lunchtime. Sensibly they have a food stall, and just ask for donations to get in. The concert kicked off with Heidi Elva, a harpist from New Zealand, with an annoying giggle who is over fond of playing with her sampler and her iPhone apps. The harp isn’t my favourite instrument, but I can enjoy the complexities of the harmonies one person can create on it, Ms Elva was more into mood music and the occasional plink repeated ad nauseam on her sampler so I felt no guilt at all in taking advantage of the daylight to read a book until she’d finished. No doubt she has fun, but it wasn’t a performance: there was nothing to look at and I really take exception to being played sampled flute on a sodding iPhone – she said that despite her constant plugs of iThis and iThat she wasn’t employed by Apple… just as well, she was putting me right off. 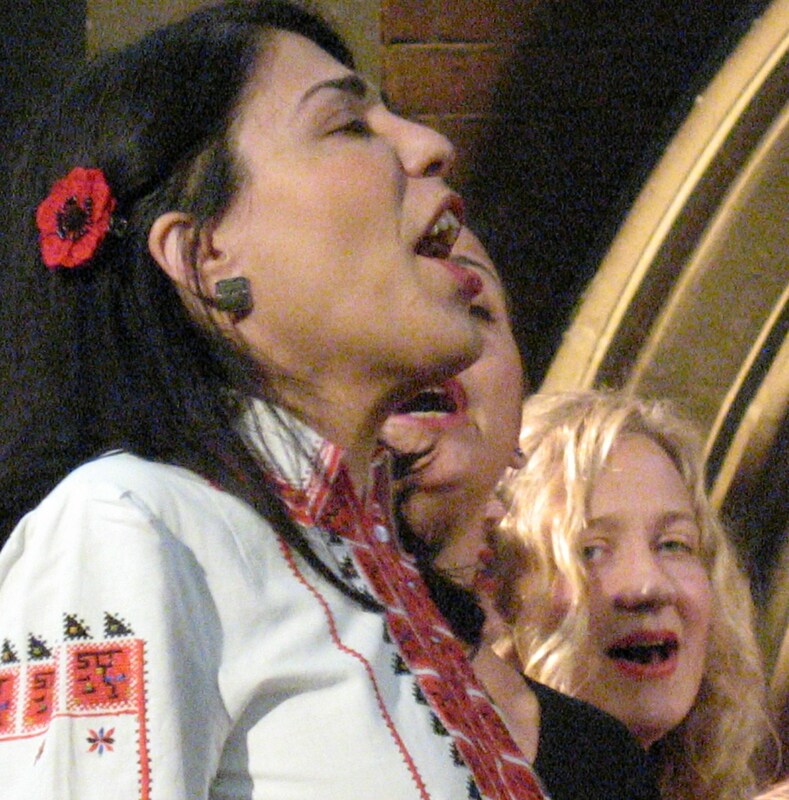 The London Bulgarian Choir were quite a different outfit, energetic, exciting and charming. I can’t tell you the names of the songs although I recognised some of them, they ranged from flirting to death, via sock-knitting (no, really!). 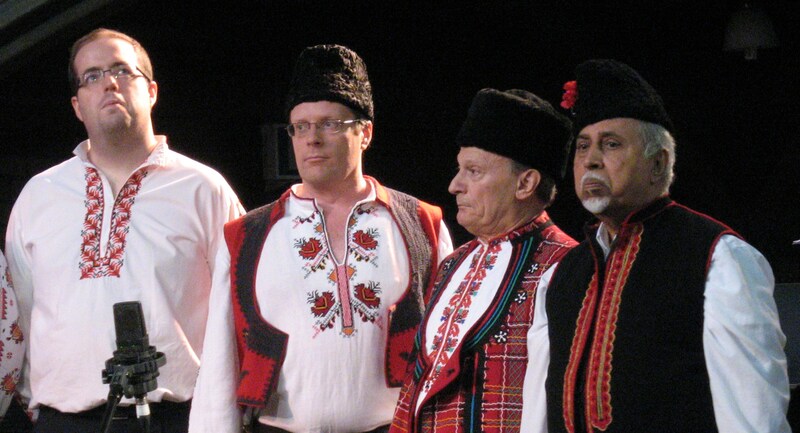 Led and discreetly conducted by Dessislava Stefanova, a long line of mostly women, in black but sporting vivid red embroidered aprons and big silver belt buckles, and men in Astrakhan hats and embroidered waistcoats, linked arms and gave it some welly. There are some glorious harmonies, great dynamics, humour, pathos, drama. The occasional lead singer, drummer or windplayer steps forward for a moment in the limelight, then steps modestly back, smaller groups take over briefly for a verse or two, but this is about ensemble and community and having a good time. The acoustic in the Union Chapel suited them perfectly, and they probably didn’t need the minimal amplification they had. (UPDATE: I have been corrected, Ulrike from the choir has contacted me to say the mikes were recording them not amplifying… they really are that loud. As she says, – It’s the singing style for mountains! ) New album launched next month. It’s in my diary. Off to the singaround at The Goose is Out tonight, to round of our indulgences. This entry was posted in art, Days Out, food, London, music, review, Singing and tagged Art, Atkinson Grimshaw, Borough Market, Cherry Potts, Folk Music, Guidhall Art Gallery, London, London Bulgarian Choir, Music, singing, Union Chapel by Cherry Potts. Bookmark the permalink. I’m one of the men in hats – thank you for writing about the LBC concert! We had a smashing gig, and you’ve caught us beautifully with your words and pictures. 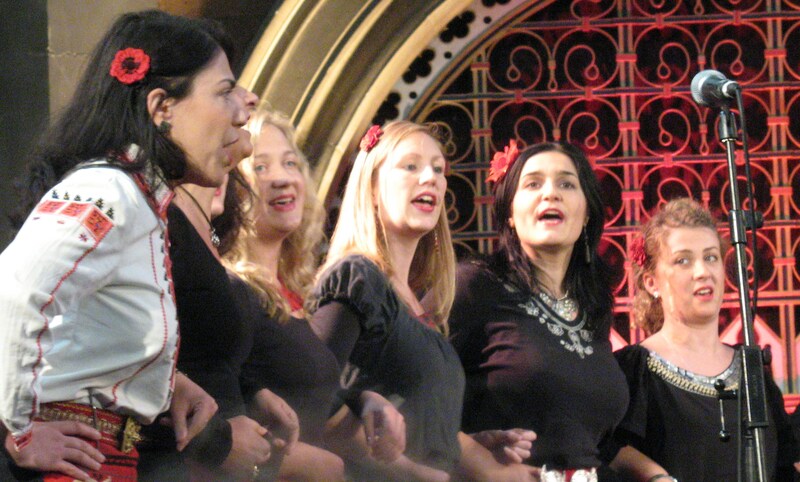 The Union Chapel is a glorious venue for any kind of acoustic music, but especially for choirs. Ulrike’s right to say that we weren’t amplified. However, you (and you readers) might be interested to know that the microphones on stage were being used to record the concert. If it passes muster, parts will be broadcast on ResonanceFM later in the year, in Ben’s “Arctic Circle” slot.